The Virginia State Bar Access to Legal Services Committee has awarded the Prince William County Bar Association the 2018 Frankie Muse Freeman Organizational Pro Bono Award, which is named for the famed civil rights leader and first woman appointed to the U.S. Commission on Civil Rights. The 518-member bar in Northern Virginia has donated hundreds of hours of legal services over the years via a variety of programs designed to fit the needs of the low income and underserved residents in their region. Formed in 1995, the bar’s pro bono committee established a domestic violence program, its longest running one, to provide legal assistance to victims of domestic violence. The bar also turned the VSB’s So You’re 18 booklets into a yearly service project, where volunteer attorneys present and answer questions about civic duties, rights, and responsibilities of legal adulthood to county high-schoolers. Around 6,800 students in the class of 2017 benefitted from the program. The bar’s uncontested divorce program helps couples through that civil process, and two conciliators’ programs create alternatives to traditional court proceedings for clients in civil and criminal cases. Other pro bono programs by the Prince William County Bar Association have assisted seniors, first responders, those affected by natural disasters, pro se litigants, tenants, veterans, and those of modest means who don’t qualify for services through a qualified legal services provider. The bar estimates that the total value of pro bono legal services provided by its members equals over $400,000 annually. “We continue to fulfill the original goals established by our Pro bono Committee 23 years ago and look forward to increasing the ways in which we serve the low income and underserved residents of Prince William County, Manassas and Manassas Park,” writes Executive Director Alissa Hudson in the bar’s nomination. This year’s award will be presented October 17 during the Virginia State Bar Pro Bono Conference and Celebration in Norfolk. 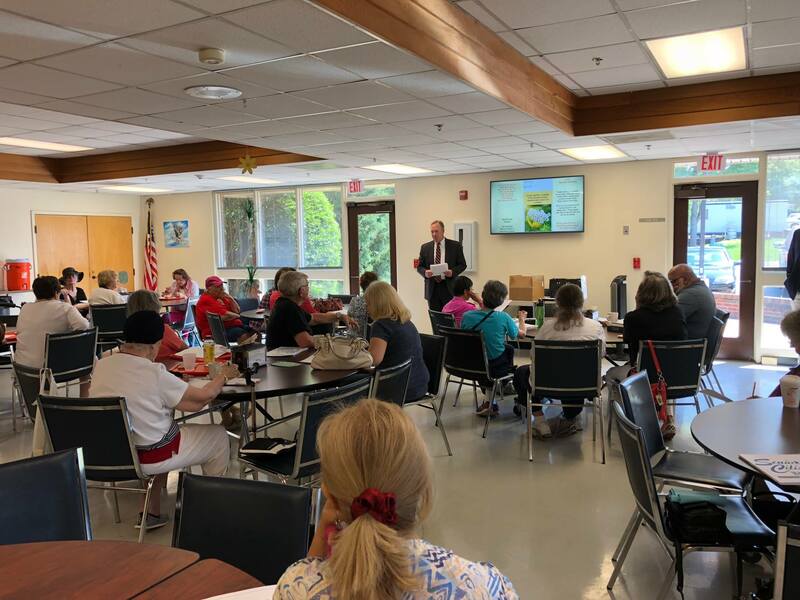 Todd Bunn speaks at a Prince William County Bar Association Senior Law Day Program at the Manassas Senior Center in May.